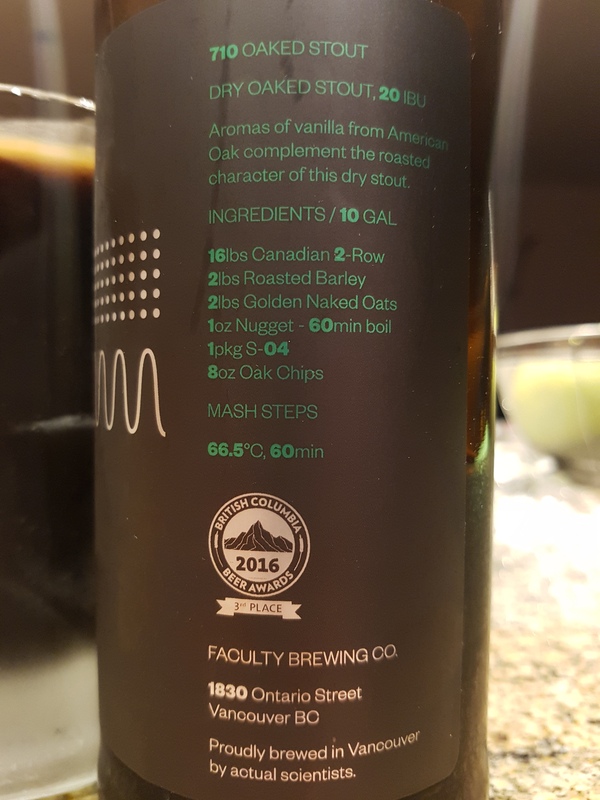 710 Oaked Stout – Faculty Brewing Co. (Vancouver, BC, Canada) | Justintoxicated. -Faculty Brewing Co.! Located in central Vancouver off of Main st. where all the hip breweries are popping up left, right and center. This is the first brew that I’m trying of theirs and it gives me the impression of them being just and “average” brewery. Let’s hope they can up their brew game in the future releases. Visual: Pours thicker viscosity dark coffee brown without much of a head, a very thin ringed retention, mild oil slick on the surface, slow micro stream along the perimeter. Uneventful. Nose: roasted barley malt, hints of caramel coffee, cocoa notes, oak presence. (lvl-7)-pungency. Summary: The flavours are okay but this tastes rather basic and fails to wow. The stout base doesn’t feel full enough and the sour notes in the mids detracts from the dark notes. Just an average brew with some oak influence, not memorable.